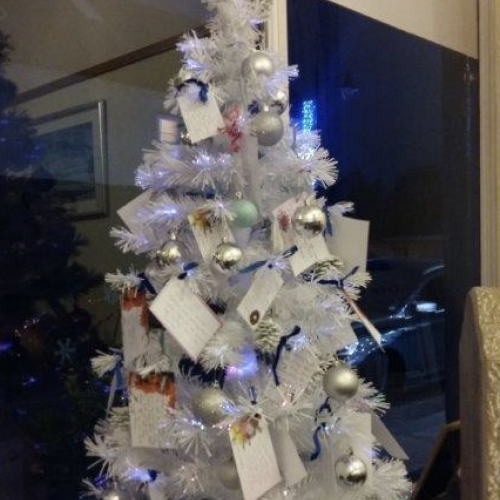 Each year, all Lodge Brothers branches put up a ‘Memory Tree’, allowing people the opportunity to write a card to remember a loved one who has passed away. In Windsor, branch arranger Jill Palmer went one stage further and called on some local school children to help decorate her tree, and then last Sunday, she invited a local Minister to bless the tree in a short service at the branch in St Leonard’s Road. Invitations were sent to those families who Jill had met throughout 2017, and no less than 28 people turned up to the service! “It was a very meaningful time to those who came along,” Jill said, “and we stayed afterwards to chat over a mince pie and a drink. It was a special occasion”.